A military coup in Fiji and a pro-democracy movement in Tonga: Polynesian scholars Fuifuilupe and Loa Niumeitolu talk about governments controlled by a monarchy and a military as well as the future of these countries. 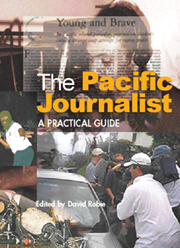 A research paper backgrounding the South Pacific region's "arc of instability" and the media response to crises (pdf file). By David Robie. The 10-year-old newspaper Wansolwara has set a benchmark for media training in Pacific island countries, says AUT University associate professor in journalism David Robie. THE SECRET DILEMMA: WHAT CAN WE DO? The story of Algerian Islamist Ahmed Zaoui has divided New Zealand. He arrived in 2002 from Vietnam, and immediately sought political asylum. Since then he has had a two-year spell in jail, a year of it in solitary confinement. Papua New Guinea is a nation-state facing many of the problems of a developing nation. However, it is the spread of HIV/AIDS that may be the country's biggest test. The epidemic has the potential to kill thousands, and wreak havoc with the fragile economy. NZ's Court of Appeal has ruled in favour of Television NZ in its long-running battle to broadcast the guilty pleas by Rainbow Warrior secret agents Alain Mafart and Dominique Prieur. And the footage has been broadcast on One News. Journalist David Robie has presented a copy of the memorial edition of his book Eyes of Fire to Vanuatu Prime Minister Ham Lini. Lini's late brother wrote the original foreword in 1986. Student journalists at AUT University compile news reports on the ongoing West Papua struggle for self-determination. 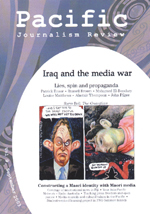 In Australian media reports, which in turn influence regional and international reporting of the issue, the crisis in East Timor is painted as an internal power struggle where an "unpopular" Prime Minister is opposed by a peoples' movement. The words "oil" and "gas" are hardly mentioned in these reports, even though this is at the heart of the Australian intervention. East Timor's Foreign Minister and Nobel Peace Prize laureate Jose Ramos Horta is to take over as the troubled country's security chief. The move follows President Xanana Gusmao's sacking of the discredited defence and interior ministers. WHAT IS HOWARD'S ROLE IN THE TIMOR LESTE COUP? A transcript of Australia's controversial Channel Nine Sunday programme about Fiji on the eve of the 2006 general election. WHERE NEXT AFTER THE RIOTS? Journalist Jon Stephenson shares his experience of working in the earthquake zone in North-West Pakistan. Articles on this website are for educational and research use. © 1996-2006 Asia-Pacific Network. All rights reserved.